Toss the Calling Cards to Dominican Republic! …And get the plan everyone is talking with (and about)! But you’ve got a cousin — always the rebel — moving to the Dominican Republic. You already know how to call Dominican Republic, and you applaud his independence, but you worry about the cost of Dominican Republic calling cards. 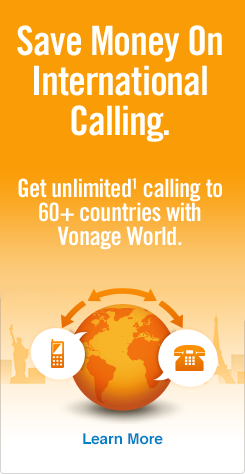 Unfortunately, the Dominican Republic isn’t a country included in the long list of countries supported by Vonage World®. Think you’re out of luck when it comes to free calls to Dominican Republic? Vonage begs to differ. 100 combined minutes to landlines and mobiles in select Latin American countries; check out if the country you want to call is covered by Latin America 100. Vonage World Plus Latin America 100 allows you to keep in touch with your loved ones in Puerto Rico, while still being able to call your cousin without worrying about super high rates or complex calling cards, so you can essentially call Dominican Republic for free. So get the Latin America calling plan here today and stay in the loop with loved ones – no matter which country they move to!